Richard Brody reviews “Mary Magdalene,” directed by Garth Davis and starring Rooney Mara, as Mary Magdalene, and Joaquin Phoenix, as Jesus. 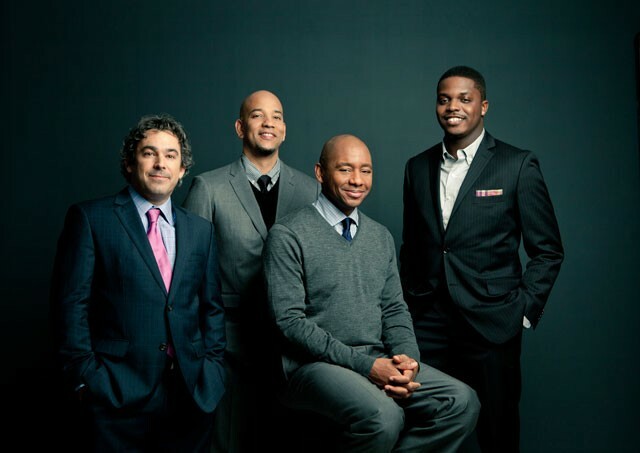 A quartet to reckon with: Calderazzo, Revis, Marsalis, and Faulkner. more within bounds, the Clowes Hall audience predictably shouted out the former Friday night. "We're old-school," he explained. "No set list." College crowd, right? What do you expect? So the Branford Marsalis Quartet socked it to the responsive throng with "Dance of the Evil Toys," a piece by its bassist, Eric Revis. It was a fine exposition of the individual and collective readiness of the ensemble to represent mightily. The composer laid down a menacing ostinato, and the sense of demonic energy only grew from there as his colleagues added to the charge. Drummer Justin Faulkner let fire an all-out fusillade behind the kit, and the ensemble balance tilted toward him in a manner that fortunately didn't characterize the two-hour performance. In fact, it was one of the best-balanced jazz quartet outings in a large hall I've ever experienced. And that's all to the good, because each of the four was consistently worth hearing. Besides the three already named, the quartet is crucially linked to the protean piano-playing of Joey Calderazzo. A key to his playing and composing lends insight into a core value of Marsalis as well: the importance of not losing sight of the responsibility to honor melody and, even more important, create tunes in the course of improvisation. On the Marsalis/Calderazzo "Songs of Mirth and Melancholy," a soft-spoken duo CD from 2010, the French composer Darius Milhaud is quoted inside the jacket saying categorically: "Melody alone permits a work to survive." The emphasis was evident Friday night in Calderazzo's "Conversation Among the Ruins," with Marsalis switching from tenor to soprano sax, as he was to do several times more. His limpid tone on the latter served the pianist's piece well. The audience palpably calmed down and became reflective along with the band. "Snake Hip Waltz," a perky Andrew Hill number, fitted in nicely, emphasizing the witty sides of Calderazzo and Marsalis. It was succeeded by "Life Filtering From the Waterflowers," another selection from the recent quartet CD "The Secret Between the Shadow and the Soul." A long piano solo, out-of-tempo or "rubato" in the jazz sense of the term, displayed the mutual trust and security with which Marsalis's colleagues do their work: Revis and Faulkner were fully simpatico with Calderazzo, everybody doing just fine without putting a steady pulse down to keep things on track. Marsalis then addressed the crowd, pretending to complain: "When will they play something we know?" To answer the presumed objection, the quartet went way back. Many years ago, a friend of mine with a jazz show on public radio made a sort of feature out of including from time to time a different recorded jazz version of "On the Sunny Side of the Street." There's a myriad of 'em. The buoyant song, with lyrics to match, has long been one of what Marsalis, citing Louis Armstrong, called "one of the old favorites." Speaking of whom: my favorite "On the Sunny Side of the Street" stems from my first record purchases as a teen == the version included on "Satchmo at Symphony Hall" (from a 1947 Boston concert). It's thrilling just to think of the stately, florid Jack Teagarden trombone solo emptying into the break, filled by Big Sid Catlett's short snare-drum rolls just before the sextet's strutting out-chorus, capped by a crowning trumpet break. 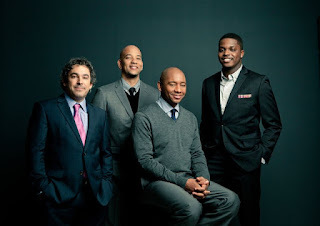 The Branford Marsalis Quartet version Friday took a deliciously slow tempo, breaking up the phrases with suspenseful rests while keeping the pace steady. The playing reminded me that Marsalis favors instrumentalists' not thinking of the lyrics to old songs, contrary to the view of many jazz players. On such an evergreen, you can hear even the drummer thinking in freshly instrumental terms. This "Sunny Side" sang after its own fashion, not beholden to any vocal conception of the song. Such an approach to melody naturally held sway in the two encores the quartet offered just after they'd charged the atmosphere fully once again with "The Windup," an original capturing both the Marsalis hometown's Cajun culture and zydeco exuberance as well as a kind of jubilee shout deriving from the black church. Taking one turn on soprano and another on tenor in succession, Marsalis led the band through a Jobim bossa nova and a crooner's favorite, "The More I See You." This group can go to the outside and generate a somewhat avant-garde fury; but it always seems to have a comfortable home base to return to. The Clowes audience was amply rewarded with excellence in both areas.